Dearly Demented Mom’s birthday is just around the corner. Though she is no longer here, I still miss her terribly. Recently, I reflected on our final years together. I was lucky enough to be with her to the end of her days. There is no greater honor than taking care of a parent. When I think back, I remember how her last birthdays were just as important as a child’s first birthdays. Every year was a huge milestone for a wheelchair-bound woman with dementia. I always tried to go “over the top” with those celebrations. Before sharing birthday memories, I want to explain how she came to live with me. I dragged DDM, kicking and screaming, to my house. She didn’t want to give up her freedom, but this daughter insisted. She was not right and I was convinced I could cure her. You can’t cure old age. When we took the drive down here, I didn’t know what was wrong, but I sensed it was bad. On the way from Big D, she commented on the burned-out houses, fields of flowers and other strange sights. None of those were things we actually saw and I knew I was doing the right thing by forcing her to live with me. 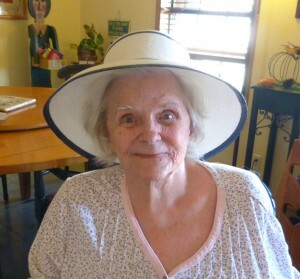 The next day I took her to the VA and they gave me the prognoses of dementia. I demanded, “Just tell me how to deal with this.” They did and so I did. It was a wonderful journey. I agreed with all her crazy ideas and we laughed our way through the disease. Yes, there were times when she was angry, but I loved her through it. Dearly Demented Mom became a beloved character to many and a blessing to me. So, in reflecting, I understand what a milestone each of her birthdays was to me. Even though DDM was clueless, I wasn’t. She began living here when she was 85 and I never thought she’d make 86. Her passing birthdays became a big deal. I wanted to celebrate her life any way I could. Thus we had a variety of wild celebrations. The first year it was all about lobster. My Bostonian mother grew up eating lobster bodies during the Great Depression. I managed to grab fresh crustaceans from the local Expensive Grocery Store. To the delight of the Teenage Eating Machine, who played with them like kittens, everyone was excited about this culinary event. Luckily, my addition of “salt water” in the sink killed them instantly. Being a true Texan was my excuse for executing them early. Then there was the year that she turned 90 and I tried to do the big day up right. I made a huge brisket, invited all her caregivers and presented her with an Angel Food cake, which was one of DDM’s favorites. Problem was, I wanted to put the big 90 on her cake, but Dearly Demented Mom was convinced that she was 78. Nothing I could do would persuade her otherwise. Luckily, I had leftover candles from the Teenage Eating Machine’s younger birthdays, so I presented her with a cake that had 90 on one side and 78 on the other. We all laughed when she blew out her two sets of candles. So Mom made it to 91 and a half. I would have loved to see her hit this 92 birthday mark, but it was her time to go. I still miss her terribly. Maybe I’ll go find myself a lobster and make an Angel Food cake. Memories make for the best birthdays anyway. Spreading love throughout the world…one mother at a time. God Bless You.